(You might want to read the background on the rosary as I practice it and its Mysteries). Looking at the political events of the last few days, and looking ahead to what we’re facing, the Glorious Mysteries are a worked example of an early mass movement. Some of the story is about what went well; some is…not. All of it is useful for reflection. The disciples think Jesus is dead; that the oppressors have won. The men are in hiding, fearful. But the women have work to do, difficult and wretched work, necessary work. Now that the Sabbath is over the tortured body of their dear friend needs to be prepared for burial. Mary Magdalen, who was—like any woman of the times—not in a position of social power, and whom history calls a prostitute2, finds the body gone. She asks what she thinks is a gardener where the body is so she can go get it. Then he says her name, and she realizes it’s Jesus. She runs back and tells the others, but they don’t believe her until someone they trust has confirmed her story. What seems like the end is not: hope is not gone; defeat is not final. The best way to go on from a terrible loss is to do the necessary, human work that lies before us. Even if it’s unglamorous, miserable, painful, it’s better than sitting around despairing. And while we do it, we have to listen to the people we usually ignore: the people who do the hard work, the people who were there and ready when the moment came. Learn to trust them, to believe them. Don’t try to speak for or over them. After 40 days with his community, the risen Jesus ascends into heaven. His followers stand dumbfounded, looking up at the sky. But he’s gone. They are on their own now. Leaders leave from time to time. Sometimes they die, sometimes they drop out, sometimes they go sour. Honor them, remember them, love them, miss them, but be ready to live without them being always there, always at our sides. Prepare for the loss, and for the feelings of anxiety and dissociation that will follow. Be able to go on without them. Ten days after the Ascension, as the disciples are (again!) hiding in a locked room, the Holy Spirit comes upon them like flames. Suddenly fearless, they begin to preach. Everyone in town hears and understands them, no matter what languages they speak; many join them. What we do isn’t about the leaders anyway. It’s about us, all of us, about taking fire and spreading our message of hope, of peace, of a better world and how to get there. We each have a part to play, and the inner resources to play it well. May our passion and commitment convince others to join us, or at least to understand us. According to Catholic tradition, Mary is carried bodily into heaven at the end of her life3. It’s the mirror of the Ascension, but for an ordinary person, for one of us. One day we, too, will have to move on from whatever roles, whatever work and leadership we have done for the movement. We must not pretend we are indispensable. (We must not make ourselves indispensable!) We should raise up the leaders and fellow workers who will come after us, nurture them, prepare them. And prepare ourselves to let them lead in their turn. The name kind of says it all. Again, this is Catholic tradition. Heaven: a place of peace and justice. Whatever we’re striving for, it’s there. We must always remember, always take the time to remind ourselves of, our goals. We aren’t activists just for the fun of it; we don’t work or organize just because. We’re trying to make a better world, something a little closer to Heaven itself. They’re also structurally fascinating. They’re part of a chiasmus, that rhetorical structure so beloved of the ancients, and their relationship to the rest of the set of mysteries is a mystery in itself. But the story structures of the rosary, and the meanings they hold, are properly another blog post or six. There’s no Biblical basis for this unless you map her to one of the various women of ill repute who also appear in the Gospels. I, personally, think it’s a calumny stemming from sour grapes and wounded pride. And possibly after her death; the theology and politics around this Mystery are complicated…and off-topic. As you may or may not know, I’m a practicing Catholic. And one of my practices is the rosary, a form of prayer that goes back to the Middle Ages. It’s a folk tradition, which means there’s a simple core, a lot of variants, and a ton of symbolic interpretation and personal association on top of it all. When most non-Catholics think of saying the rosary, they think of someone in a habit, or maybe a little old lady dressed in black, holding a string of beads and muttering prayers about Mary over and over. And that’s not inaccurate! People in habits do say the rosary, and little old ladies too. The string of beads popularized by the Dominicans is ubiquitous. And saying just the prayers that I do means repeating the word Mary 107 times; it’s the most frequently-occurring meaningful word in the English-language rosary (beating out blessed by one). But that image is incomplete in many dimensions. I wear a lot of black, but I’m neither little nor old (except to my six-foot 15 year old). And I’ll get into my personal variants of the physical rosary some other time. And then there are the prayers: the Creed, the Lord’s Prayer, the Hail Mary, the Salve Regina. Yes, we say them. But they’re just the beginning of the practice, not its end. They’re the carrier wave for the rest of the rosary, which is the Mysteries*. The Mysteries are why the rosary has lasted for me. I suspect they’re why the rosary itself has survived all this time. They’re the story cubes of the practice, the seeds of meditation, contemplation, and symbolic analysis; the thematic axes for processing the world and praying for its betterment. When I’m not up for anything more complex, they’re the categories of people I’m praying for, one per bead and only with their consent. There are four sets of Mysteries, three quite old and one rather new. The medieval ones are the Joyful Mysteries (the conception, birth, and early life of Jesus), the Sorrowful Mysteries (the events leading up to the crucifixion), and the Glorious Mysteries (the Resurrection and subsequent events; the end of Mary’s story). The newer one, the Luminous Mysteries (about Jesus’ ministry), was instituted by Pope John Paul II. I have complex feelings about it, which I won’t go into now. The core of each set of Mysteries is just a list of five events, either Biblical or (at the end of the Glorious) traditional. There’s a lot of significance and commentary built on top of them, and anyone who uses them in prayer has their own particular subset. I certainly do. But they are, at heart, just five connected events considered in chronological sequence. So today, January 20, 2017, is a Friday. Thus traditionally a day for sorrowful mysteries. How very convenient. Here’s how I’m using them today, and probably for Tuesdays and Fridays for some time to come. The evening after the Last Supper, before the soldiers come to arrest him, Jesus prays in the garden of Gethsemane. He’s fearful and anxious; he feels alone and vulnerable. He knows there’s suffering to come, and dreads it. For all those anxious about the future, particularly about health care. This is a set of intensely physical mysteries, and so many people’s physical anxieties are about health care right now. Jesus is tied to a pillar and scourged (whipped with a particular kind of implement). This serves two practical purposes for the Romans, who weren’t actually that interested in killing him. First, it’s offered as a lesser alternative; perhaps they can just beat him and let him go? And second, if the public pressure is for him to be crucified, it weakens him so he’ll die faster. For Jesus, of course, it’s an enormously painful ordeal. For all those in physical pain, particularly those with chronic conditions. This is particularly relevant as the availability of strong pain relief is being curtailed in the US. The Roman soldiers twist a crown out of thorns and put it on Jesus’ head. They drape him in a purple robe (probably just a red soldier’s cloak), call him a king, then spit on him and mock him. In the escalating sequence of cruelty, it’s logical that mental torment comes after physical suffering. For those being tormented on social media. The current venue for our personal crowns of thorns. Jesus carries the cross to the hill at Calvary. After the scourging at the pillar, he’s physically weakened. He falls several times. He doesn’t do this alone; a bystander, Simon of Cyrene, is pressed into helping him. And according to church tradition, a woman named Veronica wipes the blood and sweat from his face. For those marching in protest; for those keeping going, one foot in front of another, through difficult times. For the helpers. In the Christian context, both the darkest time and the triumph over darkness. It’s a syntactic singularity, for those of us who process things on a symbolic level. But to pick one thing out: there were two thieves crucified with Jesus; they, too, had their own journeys to that hillside, that suffering. For anyone in crisis in these troubled times. Because people’s everyday lives don’t stop, which means their pain and grief doesn’t either. Even as we watch any single event, we can see out of the corners of our eyes that our neighbors are struggling with smaller, more immediate, more intimately painful things. They need us, too. The traditional prayer to end the rosary with is the Salve Regina, which is a lovely prayer for Mary to be with us and help us through “this valley of tears”. But more and more, I’m swapping it out for Psalm 23, the King James version. In addition to being one of the most beautiful pieces of English writing ever, it’s a powerful narrative of moving from being completely flattened to death-defying courage, and then beyond it to heroic sanctity. * late thought: the relationship between the prayers of the rosary and the Mysteries is basically the relationship between Mary and Jesus. I’ve worried about this day’s cycling the whole trip. The forecast was rain, or thunderstorms, or maybe both, with the wind blowing into my face. I’d lucked out on the weather so much for the rest of the adventure; I kind of expected that luck to run out. And the plan was a little careful anyway: rather than circle all the way around the IJsselmeer coast and then return to my village, which would be some 100 kilometers, I’d decided to cheat a little and strike out inland at Monnikedam. I could close the loop at home for about 70 kilometers, and the total four-day distance would still contain the IJsselmeer. I woke to thunder and rain. I shrugged. 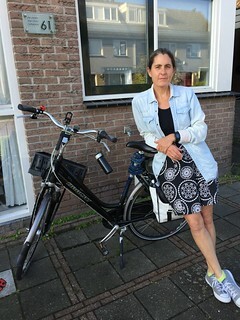 I’m a cyclist in the Netherlands. I have a rain suit. If the thunder would just go away, I could cope. I looked at the rain radar, and it seemed that the morning storm was going to be the only rain for some time. So I lingered a little over breakfast, lingered a little more when no one could figure out how to take my money for the hotel room, and finally set out in the drizzle. The mist was rising off the land, and the atmosphere was magical. I had always thought of the section of Noord-Holland I was going through (or rather, around) as fairly rural, and there were certainly areas that matched that, small villages with a few streets and old churches interspersed with farmland, visible from the top of the dike where I cycled. But I also biked through a number of towns that felt very suburban, more like the urbanized south of the province than the rural north. I suspect, in retrospect, that that entire corner of land is basically a suburb of Hoorn. As I was passing through Enkhuizen (which has both burb-feeling outer districts and a lovely old harbor), the sun came out and the world brightened. I looked at my watch and did some math, given how early it was in the day, how I was feeling (just fine), and how the weather was. I realized that, all being well, I could actually do the entire western shore of the IJsselmeer and get home in time for dinner. I texted Martin to manage his expectations and pushed onward. Although I haven’t cycled as far north as Hoorn, the nature of the landscape I was going through was deeply familiar to me: paths on top of or just inland of the dykes, more stinging nettles than elsewhere on my ride, the fields just so, the villages with their own particular rhythm, the roof shapes and road textures. As hard to describe as my beloved’s face, because it’s baseline, not variant. This is my IJsselmeer coastal landscape; everything else is defined in contrast to it. I simply didn’t know how far north it extended. Soon enough I was in Edam, which used to be the northernmost coastal town I’d cycled to. South of it lies Volendam, which is both a delightful slice of Dutch life and a mind-watering tourist trap (depending on your mental filters). I happen to like it. 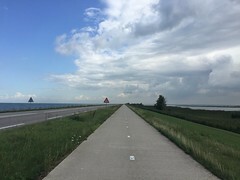 South of that, the well-known landmarks rolled beneath my wheels: Monnikedam, the causeway to Marken (amateur-level, now that I’ve done the Afsluitdijk), Uitdam, Durgerdam. Somewhere around Uitdam is the place where I stood on the edge of the IJsselmeer and had the idea for this trip, a couple of years ago. At Durgerdam I turned away from the IJsselmeer and crossed under the bridge where the circumnavigation itself started. After a few smug tweets, I cycled home, just beating the afternoon thunderstorm. Now all that remains is the laundry. My bike computer says that I did 366.22 kilometers in 20:18 hours of movement. It measures by wheel-spins, which is pretty accurate, since I took no ferries or other transport on the trip. That averages out to 18 kilometers per hour, or just over 11 miles per hour, which is normal-to-fast Dutch cycling speed. I’ve been sleeping very well, eating rather a lot, and drinking pretty well continuously. Martin found a concentrated lemon flavor to squirt into my water bottle, which has stopped me dehydrating (I find plain water rather blah when I’m exercising, which leads to bad outcomes). I was imprudent in the matter of tank tops on the first days, and have some sunburn on my back as a result. But I’m not saddle-sore. My muscles don’t ache more than I’d expect. And I haven’t exerted myself into long-term tiredness; if anything, I’ve gained energy and endurance as I’ve traveled. And four days of endorphin high is kinda fun. I have more thoughts, but those that are for sharing will take some time to filter through. Flickr photoset of the trip. My Twitter stream, with photos and tweets from the day. I’m writing this under a tree in the Noord-Hollands town of Onderdijk, watching the late afternoon sun and listening to the waves of the IJsselmeer break behind me. Today’s ride was shorter than the last two—63 kilometers—but it contained the stretch I was most concerned about: the Afsluitdijk. Also, I was late getting started. Yesterday evening, I overheard someone giving directions using the Catholic church as a waypoint. I was surprised to hear there was one in Makkum; I’d looked on the web, but seen nothing nearer than Bolsward, which was too far out of my way to attend. (Let’s just say that the Dutch Catholic church isn’t very internet-savvy.) But there it was: the church of the Blessed Titus Brandsma, the Netherlands’ own Holocaust martyr. And the sign on the door said there was a service at 9:30 every Sunday. So in the morning, I went. It was a communion service run by a deacon rather than a mass led by a priest. It was practically deserted; there were maybe ten people plus the fifteen-strong choir. The deacon himself turned out to also be a choir member, so the service was full of music, all sung-with rather than listened-to. Well, except for the bit at the end of the sermon when he moved smoothly from speaking to singing, and made it the most natural thing in the world. The sermon was mostly about a city in the Philippines that he visited a few years ago, and to which he now sends all the lightly-used and unused school supplies he can lay his hands on. It was a heartfelt and effective version of the standard “here’s my cause; please give at the door” sermon. Even if it hadn’t tied in so strongly to my thoughts about wealth and its uses, I would have been touched. After the service, I checked out of the hotel and got on Grace. My first destination was the Afsluitdijk, the 32-kilometer earthwork that closes off the mouth of the IJsselmeer. There are great 1930’s sluizen, sluices, on either side of it, each flanked by its own small drawbridge and lock system for boats. I crossed the eastern bridge just as the booms were about to come down, cutting it fine enough that the lock-keeper wagged his finger at me in (mostly) mock censure. I’m afraid I grinned ruefully rather than being truly chastened. Then the dike. I’d built it up in my head as some kind of great obstacle; it’s one of the reasons I chose a hotel only 60-plus kilometers from Makkum for tonight. And to be fair, had the wind been in my face, or the rain fallen, it could have been a very difficult stretch, because there is no shelter at all. Just IJsselmeer, road, bike path, dike. Today, however, the sun was playing with the wispy clouds and the wind was at my back. I started relatively slowly, stopping to take a panoramic photo from the dike top. But at the halfway point, I realized that if I pushed just a little, I could make the entire length in an hour. I would have managed it, too, had there not been a statue of Cornelis Lely to take a picture of just before the end. So I missed by a minute. Still, 61 minutes across the Afsluitdijk on a city bike, in a skirt, for a basically non-serious cyclist, isn’t too bad. And I still had attention to spare for the variety of wildflowers that grow in the dike beside the road, for the pale yellow butterflies that darted across my path, for the flocks of starlings that settle in the grass only to fly up, startled, whenever a cyclist comes by. I still had energy to laugh with sheer joy at the immediacy and pervasiveness of nature, taking over our serious, planned works with its unthinking, directionless force. It’s not even that nature itself is joyous; there was a dead rabbit on the bike path at the end of the dike, a memento mori if ever I have seen one. But still, I was joyful. Might have been the endorphins. The ride down the coast from the Afsluitdijk was both like and unlike Flevoland. The northern chunk of Noord-Holland was reclaimed earlier than the new province, but it was created as part of the same project. You can tell when you look on the map, because it has the same long, straight roads, widely spaced, and the same blocky feel to the land. But it’s got more trees, and the buildings are older and distinctly Noord-Hollands in shape and structure. It felt to me, having lived in Noord-Holland for eight years now, surprisingly like home. The new bit of Noord-Holland ends at Medemblik, a charming (but possibly overly self-conscious) little town. In addition to the brick buildings, the cafés, the brick fort, and the bus museum, Medmblik is the northern end of a little steam railway. I arrived in time to watch the engineers (one of whom looked startlingly like David Tennant) fill the tank with water, stoke the coal, fire up the boiler, and at last send the little train full of tourists on their way. It was all rather adorable. Then I went further south and found my hotel, which was not, on first impression, adorable. My room is small and in a dark corridor. It’s not frightening or anything, but it was incentive enough to go find a tree to sit under and draft this instead. I can’t say, looking back on the day, that I had any connected thoughts about wealth (at least not after the service). 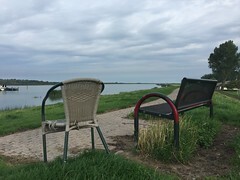 Although there’s still more traveling to do on the bike trip, the fietstocht, it feels to me like the first two days were a philosophical journey in themselves. Perhaps it’s returning to Noord-Holland, though I’ve never been this far north on a bike. Perhaps it’s just that I only had two days’ worth of thoughts on the issue before I have to start using what I have so far. I seem to be asking myself a new question, or the same questions in a new way: what wealth do I have in this situation? where in it am I poor? Today my wealth was time, and I spent it watching the train. As for poverty, I’m not sure that I have any today. I don’t know what I could want for the moment that I do not have. And I have two random thoughts, which don’t connect to any theme. The first is that I would not have enjoyed this trip nearly so much a few years ago, because my fears about my competence in the language would have put me off. But although my Dutch is still very far from perfect (or even good), I am now confident that I can make myself understood and understand what is said to me in reply. And the people I interact with pick that up; no one has spoken more than a few scattered words of English to me on this trip. The second thought is that I said that I was going on this trip alone. That’s not true. Not only have I brought my friends and internet acquaintances with me on Twitter and through these blog posts, but I have also fallen in with a wonderful variety of people along the way. A better way to phrase the matter might be that I have gone on this trip without choosing my companions myself, but rather leaving their choice to fate. Flickr photoset of the trip, growing daily. Tonight my bike is parked in Makkum, a lovely tourist town in Friesland. Not that anyone is calling me a traitor. But food can be flavored by the hands that give it, and he was kind to me. 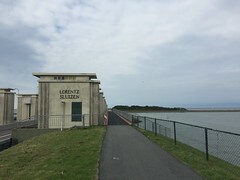 I set out on the first leg: a 20-kilometer stretch between a sheep-mown dike and the IJsselmeer, all the way up from Urk to Lemmer. 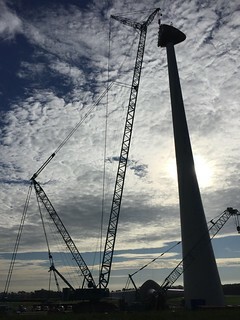 It was fascinating riding, because they’re tearing down old windmills and building new ones. 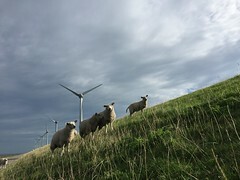 I took several photos for my growing collection of Sheep & Windmills album covers. Unfortunately, it’s also about the most isolated stretch of road I’ve been on. Virtually no one was cycling that way, and there’s nothing but a closed-off service road over the dike. Which is why, precisely in the middle, ten kilometers from the whole world, my back tire went suddenly and lethally flat. Fine, I thought breezily. I have a repair kit, and I know (in theory) how to patch an inner tube without taking the wheel off (a necessary skill: getting the back wheel off of a Dutch bike is not a roadside job). I was still feeling my way through the process when a group of three men and two women, all looking to be in their sixties, pulled up. They were on their way to Lemmer, and I happen to have pulled over right by their coffee spot. Two of the men looked kindly at my tentative fumbles and helpfully took over (not in an egoizing “sit over there, little lady” way, but in a respectful “here, let me do the bits you don’t seem to know” fashion). We found the two holes. They shook their heads over my tire repair kit—too old; the patches were degraded—and fished out a patch from their own. I did the glue, they slapped the patch on and reassembled inner tube and tire. Inflation, right the bike, repack, and…the tire was flat again. I shrugged and told them it was time for the student to demonstrate her knowledge. They nodded, a little relieved, and sipped their coffee. I flipped the bike, exposed the patch, noticed it hadn’t taken on a couple of the edges. Added more adhesive, pressed it home, re-inflated, and…flat again. They gave me the number of a bike shop in Lemmer that could send a car along the dike road, but I decided to give it one more try first. It’s not a mystery, after all. It’s just known substances, rubber and rubber cement, fixing a mechanical problem. I shook hands with my teachers, waved the party off, and sat down to apply their lessons in the meticulous style that I can only do alone. Rub off all the rubber cement. Sand. Smear inner tube and patch with rubber cement. Wait for it to dry entirely. Press patch home, hold. Check, check, double check. Then reassemble the back tire, flip the bike, repack it. Check again before riding off. I was sure the tire was losing air for the first few kilometers. I stopped and repumped it, thinking I could limp to Lemmer with a slow leak. But then, whether because riding improved the adhesion or because it was OK the whole time, it held. I passed my benefactors on their second coffee break, and called my thanks to them as they waved and gave me thumbs-ups. Then I stopped at the bike shop in Lemmer and bought a new repair kit. The entire episode completely failed to sink my spirits. Some of that is endorphins, but more of it is the kindness of the people who stopped. I was reminded of the St Christopher medal zip-tied to my bike, and the story that probably created him. Without a flood, without the danger to carry the child across, there is no saint. I begin to think his value is more in dealing with travel disasters than preventing them. I had no further chances to find out after Lemmer. That was my gateway from Flevoland the much older province of Friesland. The difference between the provinces was immediately apparent in the absence of that sameness that I mentioned yesterday. 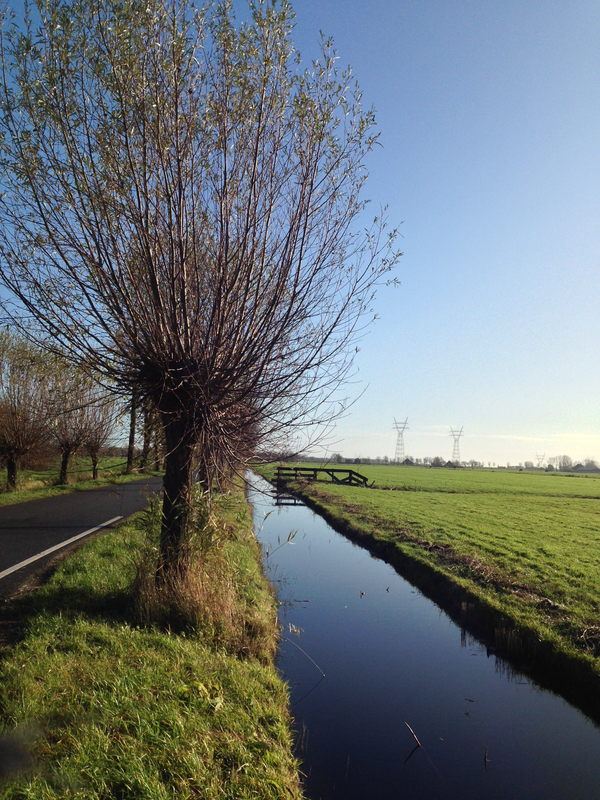 There are no long stretches of unchanging road in Friesland. Nothing aligns to a grid. There are more trees and fewer windmills; more cattle and fewer sheep. Unfortunately, there are also long stretches where nothing runs along the coast, and I had to veer inland rather than sticking to the IJsselmeer. But inland was beautiful too, with actual (low) hills, cattle, and farm fields full of swallows in murmuration. 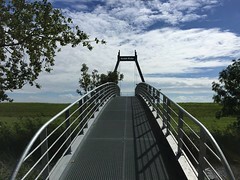 I saw oddities: a literal bridge to nowhere, designed so that the viewer can see over the dike in one particular spot. A wooden frame for photographing the landscape through like a postcard, opposite a strange openwork concrete tower. 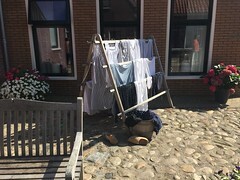 I ran into a local festival in Hindelopen, complete with women in traditional dress singing a haunting a capella piece in Frisian (also, a laundry rack hung with traditional underclothing). I outpaced a tractor for five kilometers before it came close enough to overtake me (very Rush). The day was hot and the wind sometimes against me, but I still made good time, arriving in Makkum at about 5:30. Particularly considering the lost hour in the morning, this is completely acceptable. And what was I thinking about when I was riding? Wealth, of course; my mind continues to worry at it like a dog at a bone. Because it occurs to me that, despite all of my material and immaterial possessions, I don’t feel wealthy. My sufficiency is all but invisible, while a different kind of poverty grinds away at me: time- and attention-poverty. I never have enough of either to make my cognitive rent (work and family), pay my intellectual subscriptions, and have much left over for the pleasures of the mind. I make do with threadbare thoughts, the discount goods of skimmed reading, and the street-corner salvage of summaries whose details I haven’t the energy to pursue. Sometimes I salt away a few hours’ worth of original reading or a bike ride’s connected thinking as an investment for future dividends of insight. But mostly I live thought to thought, hoping no large intellectual bill will come due. Then I got that flat tire, which (#irony!) interrupted that train of thought, probably for the best. Self-pity is not a good look on me. Because the lesson of the flat tire, and of the gift sandwich I ate later in the day, is that people are sustainable wealth: kindly people, helpful people, inventive people. The pleasures of conversation and friendship are like the pleasures of acquisition and having, but they impoverish no one else, take up no more room in my crowded attic workspace, add no carbon to the atmosphere. They’re a context in which my children can grow up to be as wealthy as I am, if not more so. I’ve kind of known this for a long time. When I say that the Netherlands is a wealthy country, what I mean is that the educational system is good, the physical infrastructure is created for the use of people (including the famous public art), and the society itself is rich in helpfulness. Despite companies’ attempts to do an end-run around them, the labor laws and the social safety net are a material contribution to the well-being of the people who live here. And the widespread acceptance of part-time working by both parents and the community mindfulness of everyone’s children are an investment for future dividends, both emotional and financial. All of this is also another reason that our treatment—Europe’s and America’s—of our respective populations of refugees is so wrong. The death and suffering of these people impoverishes us all. And the irony is that, trying to hold onto our material prosperity, we forget that it’s the human wealth that endures and grows. The refugees on our borders are wealth, begging to enrich us in ways that will outlast money itself. I’m sitting in a hotel room in Urk, Flevoland, typing this. I know the town name sounds like some kind of interjection, but if it were then the place would more accurately be called Aah, or perhaps Ooh. After seeing Fiona off to school (Alex was sick), I loaded my luggage onto Grace (my bike is named Grace. If you didn’t know before, well, now you do.) I’m packed very light indeed: minimal clothing, lightweight tech, some food for the road, bike tools, towel, rain gear. And then I did precisely what I said I’d do yesterday: rode toward work, and went straight where I’d otherwise have turned right. That took me across the Noordhollandsch Kanaal, over the freeway, and along the narrow, cobbled Nieuwendammerdijk. I crossed the IJ on the Zuiderzeewegbrug, which is the only bridge between Amsterdam and the IJsselmeer (everything else goes by ferry or tunnel.) Much of the route is familiar to me from the Dam tot Dam walk that Martin and I do every year. It was all somewhat hard going, because the wind was from the south. Mind you, that was a good thing, since that same wind would be at my back for the longer stretch through Flevoland. But then things got easier; I turned east and rode through a series of parks and sheep fields toward the tiny town of Muiden. 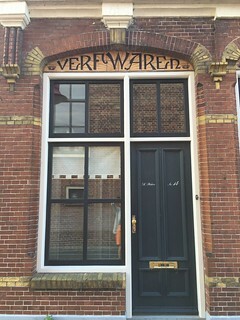 Muiden is old. 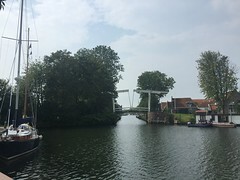 It sits on the mouth of the river Vecht, and has only one single-lane bridge for all traffic that wants to cross it. I adore the place, but it’s kind of a pain. 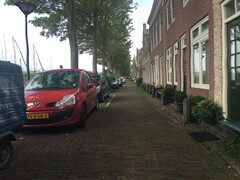 After Muiden, I took the road that follows the coastal dike. 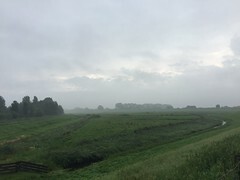 Like a lot of Dutch dike roads, it’s on the land side and below the top of the earthworks, so one has the sensation of riding beside a tall green slope, with no notion of the weight of the water on the other side. To my right, the land spread out: peaceful fields and plump cattle basking in the late August sun. I passed through Muiderberg and headed to the Hollandse Brug, the route to Flevoland. Flevoland is the new province, built by filling in some of the old Zuiderzee. It’s beautiful, but it’s also made up of very long, straight, unchanging stretches. One can lose one’s self in the pursuit of the vanishing point. I did, several times. (This is good practice for Sunday, when I will be crossing the Afsluitdijk, the ultimate long, straight, unchanging stretch of bike path). But no one told the plants or the sheep that they were part of a homogenous landscape. The birds didn’t get the memo either. Looking more closely, one sees the individual variety that combines into this illusion of simplicity: the way the birds gather here rather than there, the ragged clustering of the sheep, the surprising variance in the population of grass along the path, the way the trees all look like Old Master paintings. I suspect that in a hundred years, the landscape will start to vary, in the same way that a development of identical homes gets more character as people start moving in and changing things to suit themselves. This was when having the wind at my back was best. I made good time along the coast and through the city of Lelystad. I had a wrong turn or two before I found the coastal road north of Lelystad, which runs between a vast line of windmills and hills that are kept trim by means of a flock of sheep. Something inspired me to tweet about a fiddle band named Windmills and Sheep, and now it’s part of my private vocabulary. Crossing to the Nordoostpolder, the older part of Flevoland, meant cycling athwart the wind, and suddenly everything was harder. Emblematically, the sheep were more isolated and the windmills under construction. But ahead of me was Urk, my destination of the day. Urk was once an island in the Zuiderzee, with a harbor and a village full of fishermen. But when the province of Flevoland was built, land came to Urk: the reverse of the usual process, when erosion turns inland villages into seaside ones. Urk is a lovely wee place, with a large harbor and a small beach, full of restaurants that serve fish. 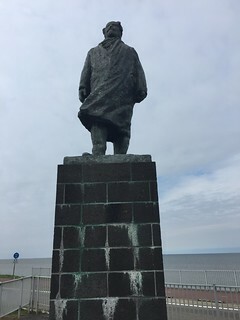 There’s a memorial to fishermen lost at sea, with a statue of a woman looking away from the water and a series of plaques listing every Urkerman lost to the waves from 1717 until the present. I walked along the beach and gathered sea glass, and thought about wealth. It’s a topic that had been rattling around in my head all day, as I anxiously rationed my photographic time lest I be too slow to get to Urk, as I filled and refilled my water bottle from the liter and a half I’d brought with me, as I monitored the battery level on my phone. And I’d been thinking about it as I rode past the vast stripes of undifferentiated, inedible greenery beside the bike paths of a country that had suffered terrible famine in living memory. This trip is the product of incredible wealth: my household has enough resources, financial and emotional, to spare an entire adult for four days. More than that: I can stay in hotels and eat in restaurants on the way. And the land is wealthy, with money to spare not only for grass and good bike paths, but to build an entire province out of an inland sea. Of course, the construction of the land and investment in the infrastructure is wealth well-used: invested for the future, where it will repay that investment many times over; invested in the happiness and well-being of the people who live here. And there’s a fair argument that this trip is an investment in my happiness, my good emotional health. But wealth leads to greed the way that spring leads to summer. I like to think I have my own greed, my own desire for more than I need, well in hand. I ride a used bike, shop at secondhand stores, make my own clothes. But when I looked at my collection of sea glass, fifteen or more pieces, mostly green and clear, many of them undistinguished, I knew better. 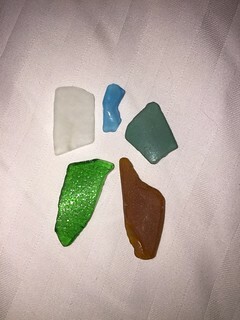 I have sea glass from so many beaches that I lose track. I don’t need more forgettable pieces. And yet there I was. So I decided to pare the collection down, to only take five from the beach. Five that were special to me, because of their color or their texture. The rest would go back for someone else to find. That was hard. I chose one of every color I had: clear, green, sky blue, turquoise, brown. But the turquoise and the sky blue were the only specimens of their color that I’d found, so even my five pieces represent a kind of poverty for later beachcombers. We need to take up an ancient lesson, found in different religious traditions and also in the Bible. It is the conviction that “less is more”. A constant flood of new consumer goods can baffle the heart and prevent us from cherishing each thing and each moment. To be serenely present to each reality, however small it may be, opens us to much greater horizons of understanding and personal fulfilment. The Pope’s point, and it’s a good one, is that we cannot keep up with our acquisitiveness. There’s not enough stuff in the world to feed the whole planet’s hunger for the shiny. I fear that we cannot change, as a people, in time to save the world. But I can change. Tomorrow, somewhere along the way, I’m going to leave the five pieces of sea glass behind to delight someone else. The memory of finding them will be wealth enough, properly invested. This morning, I got up, got dressed, and got on my bike. I cycled south from my village into Amsterdam: right turn, left turn, right turn, cross the river, get to work. It took me about half an hour. Tomorrow morning, I’m going to get up at about the same time, get dressed, and get on my bike (albeit with the saddlebags bulging a little more). And I’ll cycle south from my village into Amsterdam: right turn, left turn…but then I’ll go straight instead of turning right, pass under a viaduct, jog left, and follow the road as it unspools in front of me in a new direction. I’ll cross highways, canals, rivers, provinces. I’ll cycle over bridges, through cities, into villages, among sheep, past birds, under windmills, along dikes. And through it all I’ll keep the IJsselmeer to my left until I get home again. It’ll take me four days. The desire to cycle really far has been growing in me since I started biking around the Noord-Hollands polder. When I’m out in the open land, there’s a part of me that wants to just keep going, to do something monumental and vast to match the space around me. Over time, that’s coalesced into the wish that I could circumnavigate the IJsselmeer, the great body of fresh water that makes the shape of the Netherlands so distinctive. The story of the IJsselmeer is the story of the country itself. It grew from small lake surrounded by over-drained, sunken land (medieval water engineering was still in beta). It became the salty Zuiderzee after a series of floods in the late Middle Ages broke the dikes, filled the sunken fields, and scoured the ground away. Through it sailed the ships of the Golden Age on their way to Amsterdam, and from Amsterdam to the world. Even the process of taming it into the IJsselmeer was characteristically Dutch, undertaken with stolid practicality in difficult times: turning a vast salt body fresh and filling a large part of it in during years of economic hardship, war, famine, and natural disaster. Now it’s tranquil water surrounded by peaceful, prosperous land, and both land and water are mindful of their history but not haunted by it—much like the Dutch themselves. I figured the trip would take about four days; I reckoned the best time to do it would be late summer. I idly elaborated on the idea as I cycled to work or wandered the countryside. It was a dream project, something to do “one of these days”. But it’s such an achievable dream, whispered the wind out in the deep polder. Over four days, it’s maybe 90 a day. You ride 30, 40, 50 kilometers already, and don’t even notice it the next morning. Only a little extra conditioning, a little planning, the kindness of Martin and the kids, and you can do this. Come. Come. So “one of these days” is tomorrow, and I’m coming…but in my own way. Not in garish Lycra, not bent over on a racing cycle, not whirring through the air like a bright arrow in flight the way the denizens of Clan Spandex do. It seems right to me to do this in my ordinary clothes and on my ordinary bike, just as when I go to work, run errands, or wander the Noord-Hollands countryside on a Sunday afternoon. It’s a mix of the ordinary and the extraordinary, like water in wine, like the IJsselmeer itself. The longer I live in the Netherlands, the more I realize that autumn is my favorite time of year here. This suprises no one more than me, since I have chronic Seasonal Affective Disorder, and we do get long, dragging stretches of grey weather that sap my energy terribly. There is nothing so grim and oppressive as a dark Noord-Hollands day, when the low clouds press down on the land while the listless light robs everything of its color. But then comes a day like today, when the clouds vanish and the sun comes out in the southern sky. Then the oblique light turns the heavens into a vast and depthless bowl of blue and paints everything beneath them with pale gold. By now most of the trees are leafless or nearly so, and the elegant tracery of their bare branches underscores the simplicity of the sky they reach toward. They confine and define the space above themselves, the way an intricate frame does an Old Master painting. But although the trees are barren, they’re not drab. From a distance, single-species thickets become broad strokes of color along the horizon. 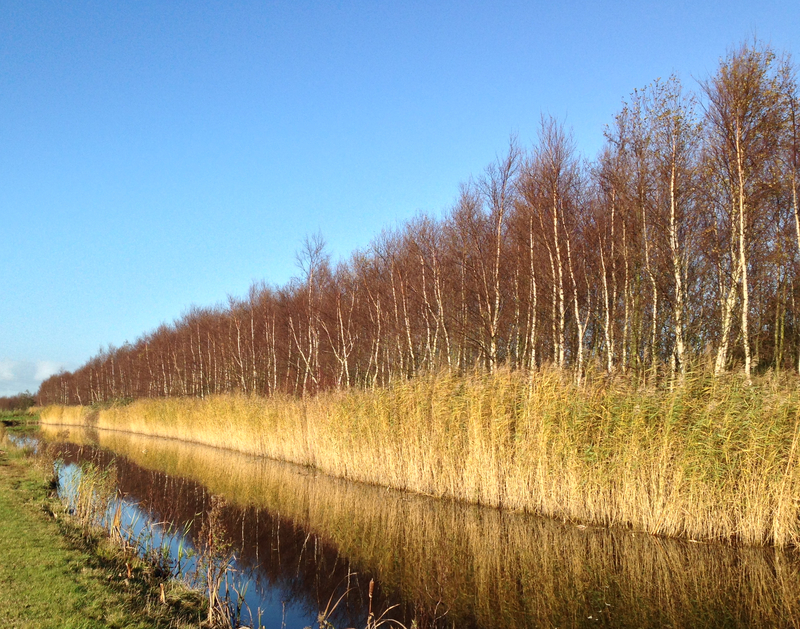 And when the reeds beside the canals die off and turn golden-brown, while the grass keeps its vivid green, those individual strokes of color combine into stripes. The land looks almost painted, as though some great abstract artist had dragged a brush across the canvas of the countryside. As much as the tiny silhouette of human civilisation on the horizon, these great lines, uniform from a distance but complex up close, emphasize and increase the feeling of horizontality all around. It’s no coincidence that the Dutch word for countryside is platteland, flatland. Language reflects the landscape it evolved in. But the element of the polder that has me agog on days like this, more than trees, grass, or reeds, more even than the horizon and the sky above it, is the water. This is water drunk on the blue of the sky, inebriated with color and depth. It’s mad and bright and glorious, uninhibited by its own muddy bottom or the faint scum of algae that floats on its surface. It has transcended itself. And it’s everywhere, because this is the polder, and the land is interlaced with sloten, the drainage ditches that keep the fields dry enough to walk on but wet enough not to shrink. Every single insignificant sloot is its own essay on the color blue, each one differently, improbably brilliant. Days like this make me think of Vermeer. He painted light the way a lover paints it, the way the water in the landscape would paint it if water could do such a thing. And his blues reach for the color of the sky reflected in that water. One could lay out the headband of the Girl With The Pearl Earring alongside a field and mistake it for a canal. But Vermeer’s best works weren’t paintings of vast landscapes. He was a master of tiny details and intimate scenes. And the polder is a landscape for that side of him as well. Notwithstanding its openness and clarity, this is also a place of secrets, of hidden treasures, when one looks closely enough. A heron stands hunch-shouldered by the waterside, waiting for fish. 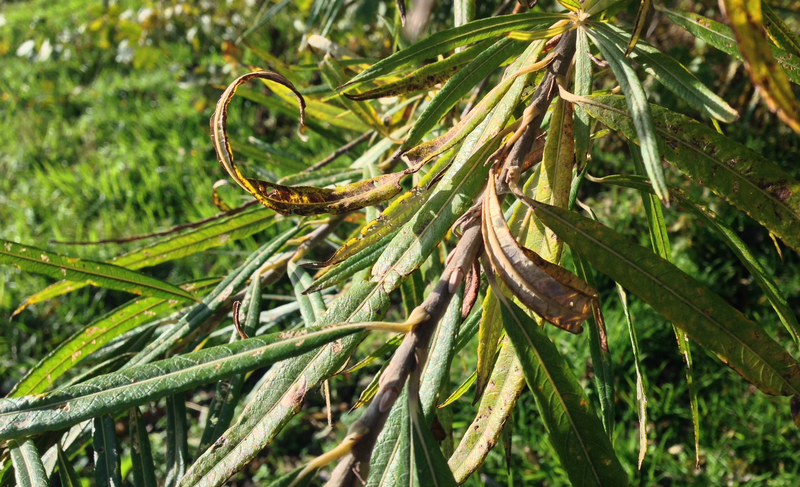 The first dying leaves of the willow curl up like fingers clenching against the coming cold. 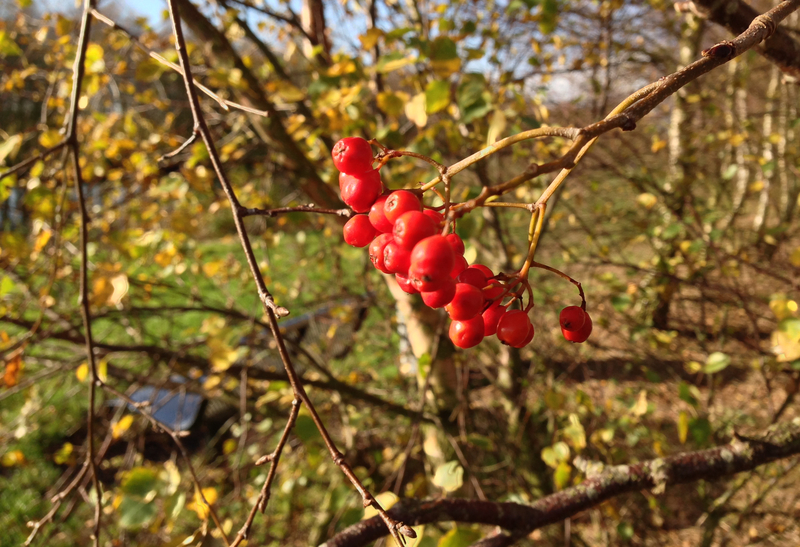 Red berries grow in among the bare branches of an aspen, unignorably bright once you spot them. 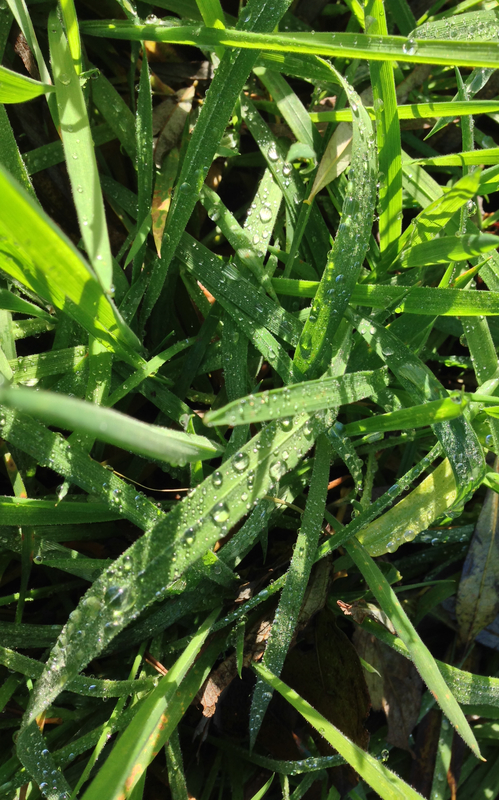 The grass preserves its morning dew, even at midday. 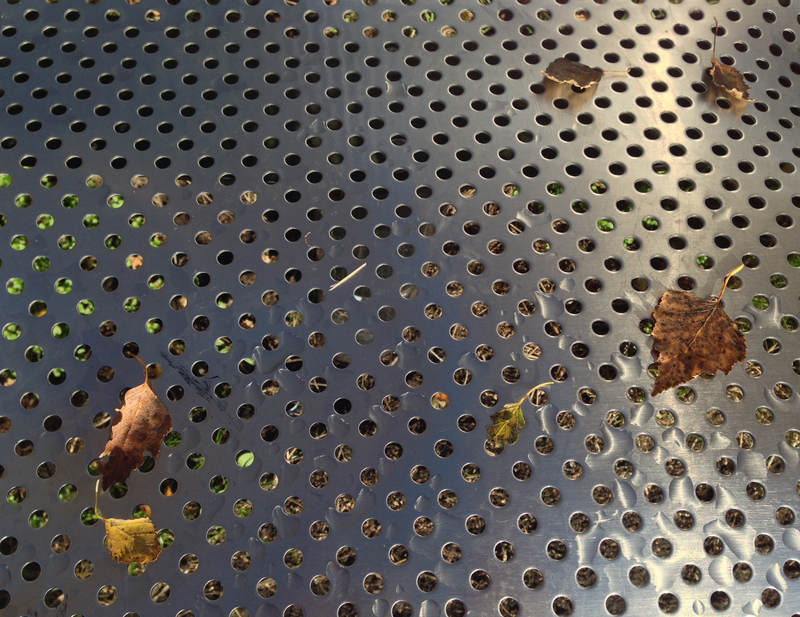 Wet leaves disrupt the even patterns of holes on a bench. In the almost impossibly beautiful sunlight of autumn, each of these things seems like a still life worthy of framing, a masterwork as absorbing and amazing as the great canvas of the landscape itself. And thus it is that what I feel, here in this land, observing it, thinking of its blue-shadowed water, is art. Eight hours for work, eight hours for rest, eight hours for what we will. For Mother’s Day last spring, we went to an amusement park in Flevoland, which is the newest of the Dutch provinces. “New” in this case does not mean “recently incorporated” or “the product of the latest local government reorganization”. It means “newly built”. A century ago, the ground under our roller coasters and go-karts was covered in water. It was part of the Zuiderzee, a salty inlet of the North Sea that was mostly controlled by dykes, but still prone to occasional storm-floods. Now it’s not only dry land, but beautiful land. Rows of poplars parallel the roads, mirroring long lines of windmills. The trees bend and the blades turn together in the wind, restless as the inland sea they have replaced. In the spring, the fields become long bright strips of tulips, let to bloom before their bulbs are harvested for sale. The only high points in the landscape are the dykes, without which, roadside signs remind us, this land would not exist. It’s a lightly populated place, with open country stretching between the neat and pleasant towns. The province is surrounded by lakes, which were all thick with pleasure boats that day, despite the late rain that kept the amusement park lines sparse. This is all the product of a tremendous investment of work, money and energy, carried out on a generational timescale. It was built with the kind of expenditure that we don’t think we can make in these days of austerity and economic collapse. But the bulk of the work of turning the Zuiderzee into the freshwater IJsselmeer and draining some of it to make Flevoland was done in the early Twentieth Century. That wasn’t a fat time in the Netherlands. 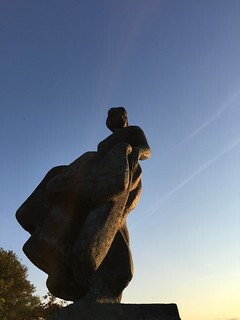 Although Dutch neutrality preserved her young men from the killing fields of the First World War, no one in Europe was safe from the Depression. Then came World War 2, with the harsh and costly German occupation. And the Hunger Winter, which immediately followed liberation, was unspeakable. A few short years after that, the Watersnoodramp, the great flood of 1953, rendered 100,000 southern Dutch people homeless and soured a wide stretch of still-vital cropland. Contemporary trends had a major impact on the layout of Flevoland. 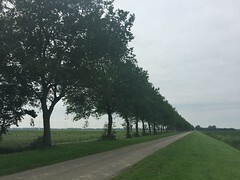 The Northeast Polder is typified by farmland and by woodland on soil unsuitable for crops, and an urban centre in Emmeloord with a ring of ten satellite villages within cycling distance – cars were not a major factor in those days. By the time Eastern Flevoland fell dry, land use requirements had clearly changed. Farmland was still widely available, but outdoor recreational facilities and demand for residential areas and good road links now also jostled for space. There are now four urban centres in Eastern Flevoland, the provincial capital Lelystad, Dronten, Biddinghuizen and Swifterbant. 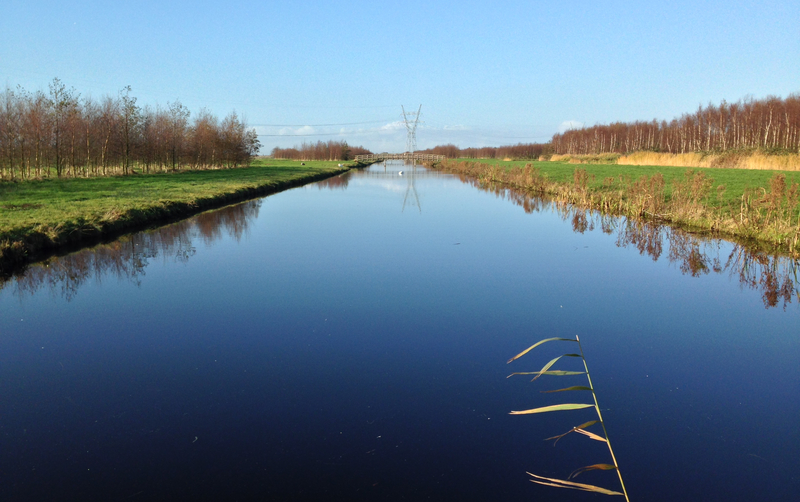 In Southern Flevoland the polder is no longer just an area of farmland. Together with greenbelt areas laid out for nature, recreation and agriculture, various urban centres make up the town of Almere, which currently has some 186,000 residents. The south-western corner of Flevoland has been designated as an overspill area for the country’s western metropoles. 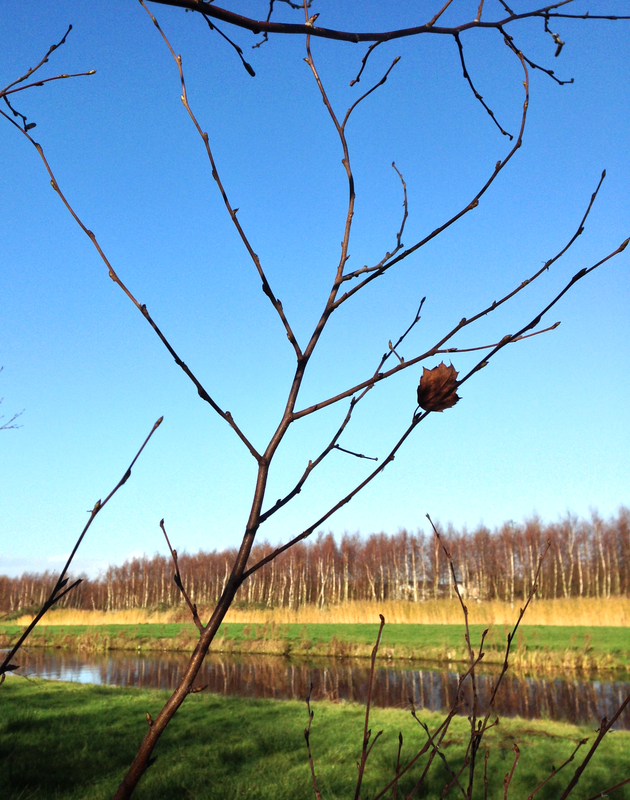 Zeewolde is located where woods and water meet – a fulcrum of outdoor recreation. —from the English-language Provincie Flevoland website. We came into the province through that southwest corner, driving by Almere. The city is Flevoland’s contribution to the Randstad, the great conurbation of the western Netherlands. But it also serves as the gateway to the rest of the province, and the land near it is given over as much to recreation and nature as to farming. 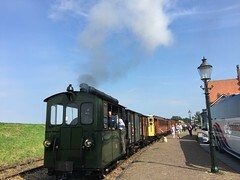 Indeed, our trip was exactly what the last of Flevoland’s designers intended: a journey for pleasure from the populous Amsterdam area into more open countryside, where there is space for amenities such as an amusement park. Coming that way, we also passed a herd of concrete elephants by the road, rounded, abstract, mute, and memorable. They’re a Flevoland landmark, something everyone photographs in passing—and no one seems to get a good shot of. We didn’t. The elephants may be distinctive, but they are not unusual. They stand in a nation where the roadside sound baffles echo Escher and monuments to superheroes with briefcases lurk in business parks. 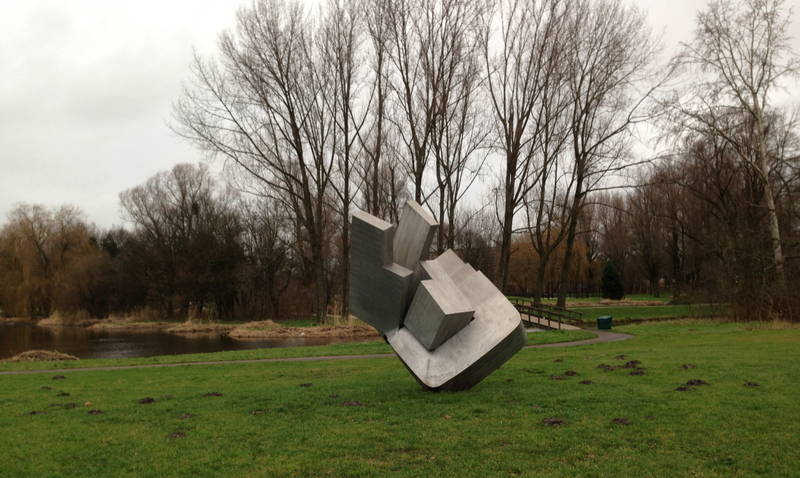 Dutch public art is as pervasive as its water engineering, albeit much stranger. The quiet street where we first lived here is graced with a curving abstraction in blue metal, while a chicken made of horseshoes stands guard over the local toystore. And we are not a particularly art-laden village. 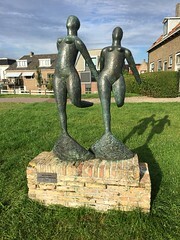 If you ask a Dutch person why there’s all this sculpture around, they may tell you about the law that requires it: between 1 and 1.5% of the budget for every government project must be spent on art, chosen by public consultation. But that’s more of a how than a genuine why. The true, underlying reason is so embedded in the culture that it’s all but inarticulable to my friends here. Public art is there for the public to enjoy. There is so much of it here because the public are important enough that their pleasure and enlightenment is as worth spending money on as a new road or government building, just as their ability to live somewhere beautiful was worth a portion of the resources spent creating a new province. This is the democratization of the art of the Golden Age: the ordinary people who were worth painting then are worth pleasing and uplifting now. And the privilege of being valued like that has spread from the merchant classes to the entire society alongside prosperity, education and control. 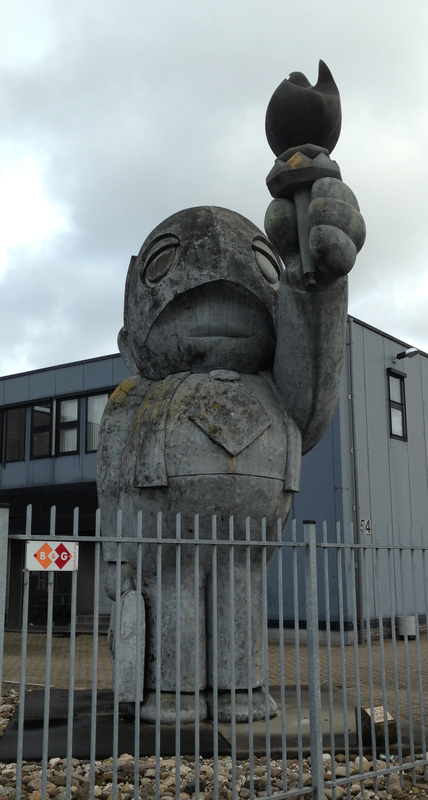 But the fact that Dutch public art is so varied, and so odd, carries yet another message. The public is not just worthy of being pleased; it’s also worthy of being challenged. Strange public art is an expression of trust that the viewer has the capacity to consider it and judge its worth. It even dares to be disagreed with, disputed, and disliked. It takes the risks of engagement, as with a peer, rather than the privilege of lecturing from above. And the Dutch have, on the whole, risen to the esthetic challenge, embracing visual styles that leave my British and American tastes baffled. I had thought myself relatively educated, adventurous, and sophisticated before I moved here, but now I’m scrambling to keep up. But the scramble is in itself worthwhile. Living here, engaging with a culture that values its population’s leisure and pleasure—not just with words, but with its resources—is as much a challenge as figuring out any individual piece of public art. And meeting that challenge is reforming me, draining my old unthinking assumptions and revealing new provinces of thought and understanding, new values and things to value.